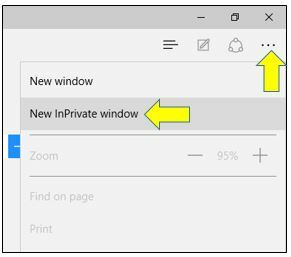 This tutorial will show you how to use Microsoft Edge InPrivate browsing feature. Every web browser nowadays offer feature of browsing the Internet privately, without leaving any traces of the website visited or cookies and temporary Internet files being saved on the system once the session is over. Google Chrome users are familiar with this feature as Incognito Mode, in Microsoft Edge this feature is called InPrivate Browsing. Click on the More actions button in the top right corner and select New InPrivate Window. Alternatively, you can press Ctrl+Shift+P keys combination. At any time you can tell if you are in private browsing mode if you see the InPrivate logo in the top left corner of the window.